I’ve always been interested in the limits of music. I’m speaking here not of the parameters of what music can do as limited by human perception and imagination in the realms of performance and composition (although that is a fascinating subject), but of the social implications of sharing a musical experience in the context of a commonly held public space. Put more simply, to what extent do our freedoms and liberties apply to the production of music in a public space, and do we have individual rights to accept or decline being exposed to it? For me, it is an issue that is just as important as the debate about public smoking. Over the years I’ve become somewhat radicalized over the issue, which falls under the large umbrella of noise pollution. While the health risks may not be as blatant and demonstrable as second-hand smoke, I argue that everyone has a fundamental right to silence. Admittedly with all of the problems in the world it’s a hard argument to wage. This never has been a pressing legal, cultural, or health-related issue for most people. Many people have acquired an ability to filter out the ambient “background” music. And in the process they have developed an ability to numb themselves to music generally. This devaluation of the musical experience is the sad byproduct of a culture that ironically prides itself on the artistic value of school music programs and the like. There are even possibly a few people who may prefer their lives filled with the constant drone of background music, since they have an apparent psychological difficulty dealing with the natural state of silence. As someone who grew up as a member of the Muzak Generation, I’m keenly aware of my surroundings and the way in which music has been co-opted by some to control the behaviors of the masses. From the 1950s on, Muzak has been piped into elevators, doctors offices, and shopping malls all across America. One can seamlessly travel from public venue to public venue, and receive a continuous feed of carefully programmed music beamed in to a ceiling speaker close to you. It’s an amazing technological achievement. The canned music is carefully designed to be nondescript, generic and aesthetically vague – a form of audio wallpaper acceptable to the majority. The music is not outstanding enough to garner our attention, yet pleasant enough to soothe and relax our subconscious mind. It makes you happy, as if to say “go ahead, buy that sweeter,” even though you have a closet full of them. Muzak is said to be a psychological science, and is deliberately pre-programmed in timed waves (called Stimulus Progression" in their jargon) to induce workplace productivity and consumer confidence. When our blood sugar level lowers in mid-morning, up-tempo “peppy” music is methodically introduced into the intravenous tubes of our collective audio channel with predictable results: Happy people purchase more product, and happy workers are more productive. The service fills a void and was created as a relief to modern-age industrial boredom. Muzak creates an endless variety of music programming from their catalogue of over 2.6 million songs. That's quite a playlist, and to their credit, musicians and licencing organizations were paid for their services. The modern social discomfort of being trapped in a crowded elevator with a random selection of strangers silently gazing in the direction of the door is said to be minimized if “elevator” music is introduced into the equation. Airlines pipe a form of Muzak into the cabin before takeoff to calm the nerves of “white knuckle" passengers or those who suffer from claustrophobia. Doctors, often running late on their appointments, pipe music into their waiting rooms to pacify potentially bored or angry patients. Of course using music to control behavior and emotion – even inspire patriotism or rally the troops - is not a new invention. That’s what music was invented to do. But from the mid-twentieth century on it became a much more subtle social science. The Soviets used it as a technique of control in their factories. Americans have used it to further Capitalism, and I think have done so shamelessly. Muzak has been adapted wholesale by our society without the benefit of wide-scale debate, discussion, or an in-depth discussion of our personal rights. There has been no consideration about its’ potential invasion of our privacy, and little or no regard has been paid to the impact of long-term psychological and health consequences. 1) It’s not music. It’s a cheep imitation of music. Their arrangements of rock and pop tunes are cheesy, cynical, and often musically incompetent. 2) There is a sub-group of people, particularly musicians, who can not mentally “turn off” or ignore the music. Contrary to Muzak's intention, members of this group find their product very distracting and annoying. I can’t tell you how many times I’ve tried sitting at a restaurant with musician friends, and been unable to hold a normal conversation. If you are trained to listen to music and be sensitive to the subtleties of the art, it is not possible to disregard what you are hearing. My musically inclined friends and myself are programmed to listen for harmony, line, pitch intonation, timbre, and the structure of musical design over time. If any of those basic parameters are poorly executed, it makes our hair stand up. As a result, we all keep a mental list of public restaurants and venues where ambient musical sound is either non-existent or minimal. When possible, we demand to speak to the manager and lodge a request to turn off the music. Our petitions for silence are predictably ignored, and we are more oft than not viewed as weirdo’s or eccentrics. 3) Over many years of pervasive exposure, people have grown accustomed to the concept of “background music.” It’s perverted our lifestyle to the point where people now routinely put on soft background music – even at home. How many times have you attended a party when there was music playing, but no one actually listened to it? Background music is evil because it creates bad listening habits which ultimately devalue what deserves to be regarded as “foreground” music. Perhaps the shrinking audience for concerts of “foreground” music is the direct result of an over-indulgence in the consumption of “background” music. 4) Nose Pollution. There is just too much sound everywhere. We’re going deaf. Never-ending and relentless sound is physically damaging the neurons in our ears. 5) I don’t like mind control. I don’t want to be forced to hear “peppy” music when I’m tired. I don’t want to hear songs that enhance my seasonal depression while simultaneously inducing a feeling of consumer-guilt. These days, the subliminal musical message “It’s Christmas, you need to buy presents for your family” seems to begin as early as October. 6) While some people find a degree of comfort in the idea that we are listening to the same music as 100 million other people, I’m kind of creeped out by that concept. That their musical selections are chosen by committee centrally, and then piped in to public spaces all around the country at more or less the same time is symbolic nod, if not a characteristic trait, of Totalitarianism. It’s Big Brother and 1984. We can probably assume that Muzak has its own internal board of cultural “sensors” who review musical tracks for their appropriateness and positive social function. Of course nothing radical, evolutionary, or musically thought-provoking would be allowed to pass their filter. No wonder the Taliban bans music altogether. It’s social impact can be significant. 7) It’s a matter of control. Just as some people are very particular and concerned about what they eat, I am equally particular about what I hear. I don’t want to be bombarded all day long with music that I did not choose to listen to. My radicalization about Muzak began many years ago when I was working a summer job as a dishwasher at Brigham’s – a now defunct local chain of ice cream and sandwich shops in the Boston area. The branch that I worked at was adjacent to Symphony Hall. 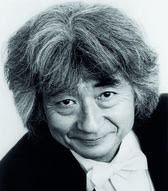 I fantasized that the Boston Symphony Orchestra’s then music director, Seiji Ozawa, would one day pop in for a banana-strawberry frappe, with extra whipped cream. We’d strike up a conversation about contemporary music, and of course Ozawa would learn that I was a composer. He would commission me to write a new piece for his orchestra, it would be a big success, and my days of dish washing would be history. It’s a composer’s version of the potent Cinderella myth. This is how I justified my working as a dishwasher at Brigham’s. The reality of the restaurant business was a little different. For one thing, I learned that fast food patrons don’t clean the majority of the food off of their plates. I’d estimate that most of Brigham’s customers who ordered a burger and fries poured far too much ketchup on their dish, leaving most of it, and the greasy fries, behind. I saw a lot of half-eaten food discarded during my shift. It added up to a lot of filthy plates during my two-month tenure in that venerable position. I also narrowly averted being held up at gun point at that job. One Thursday evening, which was my night off to compose the great American symphony, the dishwasher who took out the trash at the end of the evening was greeted by an armed robber who was patiently waiting for him. My dish-washer colleague was forced to return back into the Brigham’s as a hostage with a gun pointed at his head. The M.O.D. that evening gave the robber what he wanted, a few hundred dollars in hard-earned hamburger money, and nobody got shot. My digression about Brigham’s is not totally unrelated to the subject at hand. The stress of the situation radicalized me. Throughout all of this drama was Muzak. It’s played day and night, piped in from a receiver mounted in the back room. Happy music played even when people were depressed, angry, breaking dishes, or complaining about the inadequate or rude service. To pass the time, I would listen to Muzak analytically and try to decipher it’s secret codes and surreptitious meanings. How were they pacing the tracks, adjusting tempos, and programming just the right amount of interest without creating too much attention? It’s does seem to have an internal-logic of its’ own. One morning, feeling like an anarchist, I did something counter-cultural. I went over to the Muzak receiver and when no one was looking, turned the volume all the way off. To me the silence was surreal. It’s actually hard to imagine a bustling fast-food chain without it. But for several hours no one seemed to notice that they were being deprived of their auditory security blanket. My subversive act as an anti-Muzak-terrorist went unnoticed. Neither the staff nor the customers took notice. My great social experiment was eventually found out. The Brigham’s District Manager paid a visit later that morning, and demanded action. Along with a request that I clean the employee bathroom before the health inspector arrived, he matter-of-fact insisted that the Muzak system be turned back up again to its’ appropriate level of volume. I have no idea if sales of junk food were positively or negatively correlated to my passive-aggressive act, but the entire incident planted a seed of discontent in my mind regarding the subject of corporate mind control via music, noise pollution, and the politics of public sound: who makes it, who is forced to listen to it, and who controls it? For me, the answer is clear. As comedian Lily Tomlin once said: "I worry that the person who thought up Muzak may be thinking up something else." Perhaps they are not content just controlling what we listen to. Maybe they'd like control over our eyeballs too. capabilities and “best-in-class” partners, Muzak will deliver compelling, affordable visual merchandising solutions to clients of any size throughout the US. Visual Solutions will be offered to Muzak clients as part of the brand's comprehensive media suite or tailored as a custom content service, allowing clients to fully control their branding, messaging and customer programs. Oddly enough, on the exact same day, the company filed for a Chapter 11 bankruptcy protection in a bid to restructure its crushing debt load in U.S. Bankruptcy Court in Wilmington, Delaware. It listed roughly $475 million in combined debt to its lenders and bond holders. It’s not often that we stand up and cheer when a company files for Chapter 11. But in this case I’m glad. Last night David Letterman joked that "of course Muzak is going out of business. They can't even spell." He went on to plead against a government bailout of Muzak, citing Obama's campaign pledge to end torture.